Education is an essential element of the global response to climate change. 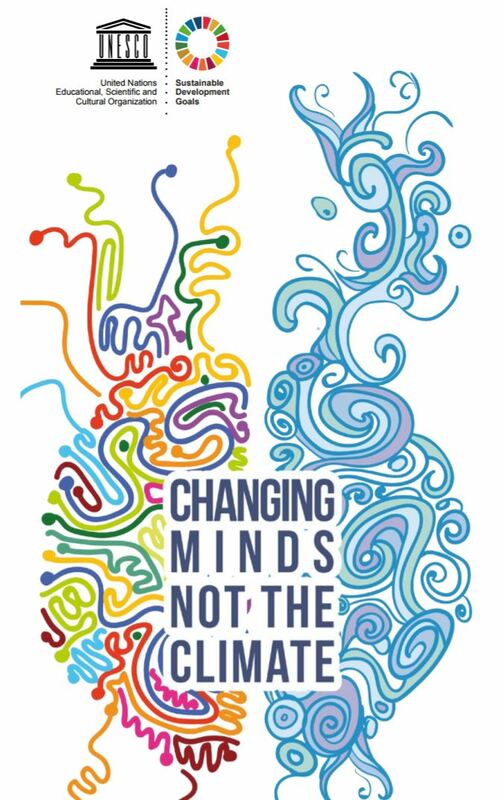 It helps people understand and address the impact of global warming, increases “climate literacy” among young people, encourages changes in their attitudes and behaviour, and helps them adapt to climate change related trends. Education and awareness-raising enable informed decision-making, play an essential role in increasing adaptation and mitigation capacities of communities, and empower women and men to adopt sustainable lifestyles. Climate change education is part of UNESCO’s Education for Sustainable Development (ESD) programme. In 2014 UNESCO launched the Global Action Programme (GAP) on ESD, the official follow-up to the UN Decade of ESD, with climate change as a critical thematic focus. UNESCO aims to make climate change education a more central and visible part of the international response to climate change. Together with thirteen other UN agencies, UNESCO promotes climate change education and public awareness at high-level events such as the annual UNFCCC-COPs through the UN Alliance on Climate Change Education, Training and Public Awareness. In particular, UNESCO supports and guides countries to meet commitments under the Paris Agreement and UNFCCC Article 6 on education. Education has to prepare all learners and segments of societies for the challenges climate change poses and equip people and economies with the knowledge and competencies to engage as informed citizens in shaping green, low emission and climate-resilient societies. As part of its work on Education for Sustainable Development, UNESCO supports countries to integrate climate change into their education systems, and facilitates dialogue and exchange of experiences on climate change education through organizing international expert meetings. It develops technical guidance material and teaching and learning resources, such as a six-day online course, Climate Change in the classroom: UNESCO course for secondary teachers on climate change education for sustainable development and many other climate change education resources are freely available on UNESCO’s Clearinghouse on ESD. It mobilizes and supports schools, including UNESCO Associated Schools (ASPnet), and training institutions to implement climate change education through a ‘whole-school approach’ whereby sustainability principles are also integrated into the management of school facilities and the governance structures of learning institutions. Through the provision of capacity-building for journalists and broadcast media on climate change, UNESCO is assisting Member States to enhance public awareness of the cause and effects of climate change, and of what countries and communities can do to adapt to the impacts ahead. This work also aids reporting on what governments and companies do, or do not do, to respond to these threats. How will you ‘Love the Ocean’?